Regarding the $100 Airline Credit, this isn’t a credit for tickets, but for additional fees such as such as baggage fees, in-flight food, airport lounge day passes and itinerary fees! The fee credit is good once per calendar year and only good when charged by the airline to your Premier Rewards Gold Card Account. No foreign transaction fees seems to be becoming a standard benefit across travel-focused credit cards and though I don’t take advantage of it often enough, it’s good to save that 2-3% charge (usually around $20-50 for me) on international trips. Access to a team of Travel Professionals who are ready to help you with all your travel needs, including booking worldwide destinations, reserving hotel rooms and transportation, and planning cruise or tour packages. 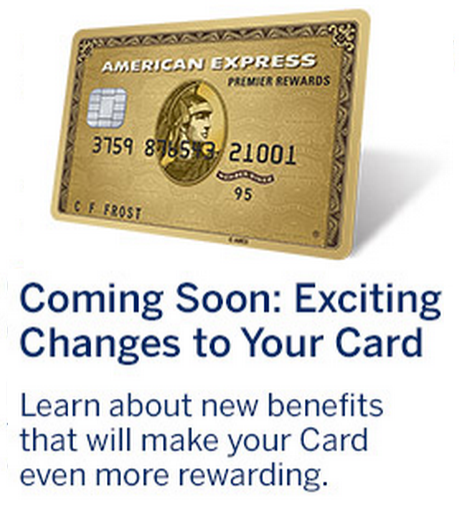 The 2X the points for restaurants doesn’t get me as excited as the other three new travel-related benefits, but it’s more than I receive with other cards. I eat out (too much) so I’ll be sure to reach for the AMEX Gold when splitting tabs when dining out. With a recent renewed push to apply for credit cards that award free miles and points (United, American, IHG, and U.S. Airways) I had been reconsidering the value of AMEX card. This was especially true after redeeming the majority of my Amex Reward points a few months ago. After all, the AMEX Gold Premier’s annual fee of $150 isn’t exactly chump change. However, with these new features and American Express’s always-awesome customer service, I’ll keep it another year to test out how much value I can squeeze out of the card. Stay tuned.